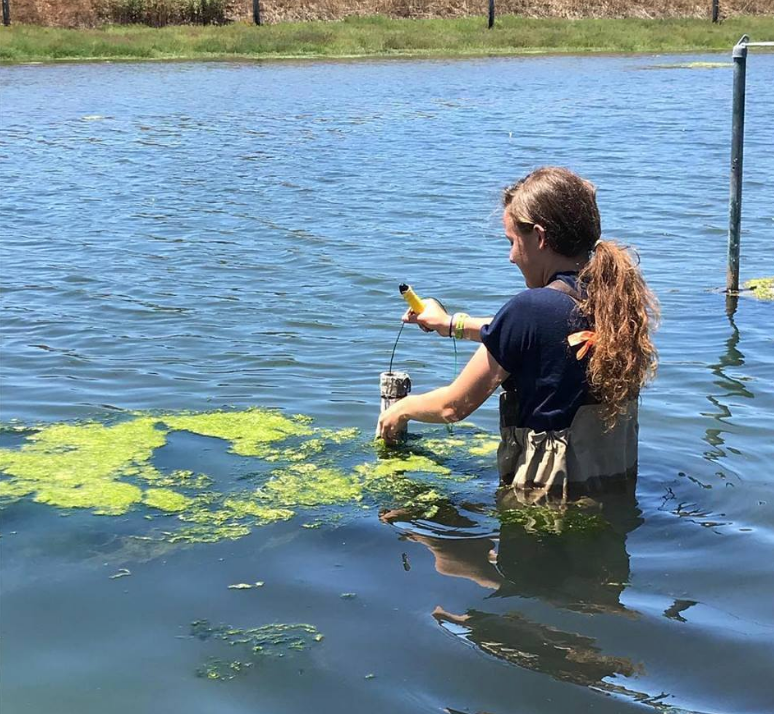 REU student Cecelia Baterbee hard at work conducting research in Moro Cojo Slough. SEASIDE, Calif., August 8, 2018–The Monterey Bay Regional Ocean Science Research Experiences for Undergraduates (REU) program at California State University, Monterey Bay (CSUMB) will finish its 5th summer cohort of visiting undergraduate researchers this week at CSUMB. The 10-week program, hosted at CSUMB since 2014 and funded by the National Science Foundation’s (NSF) Division of Ocean Sciences, provides students from across the nation the opportunity to collaborate with researchers in the Monterey Bay area to develop hypothesis-driven projects and receive critical feedback from mentors. Over the five years REU has been at CSUMB a total of 58 students from across the United States have passed through the program and applications have increased every year. “In our first year we had just over 100 applications but in the last few years of the program we have seen 400-500 application per year submitted from around the U.S,” said CSUMB’s REU program director and School of Natural Sciences associate professor, Corey Garza. The REU program at CSUMB is unique within the NSF REU system as it is distributed amongst several ocean science research institutions within the Monterey Bay region while most other REU programs take place on one campus. 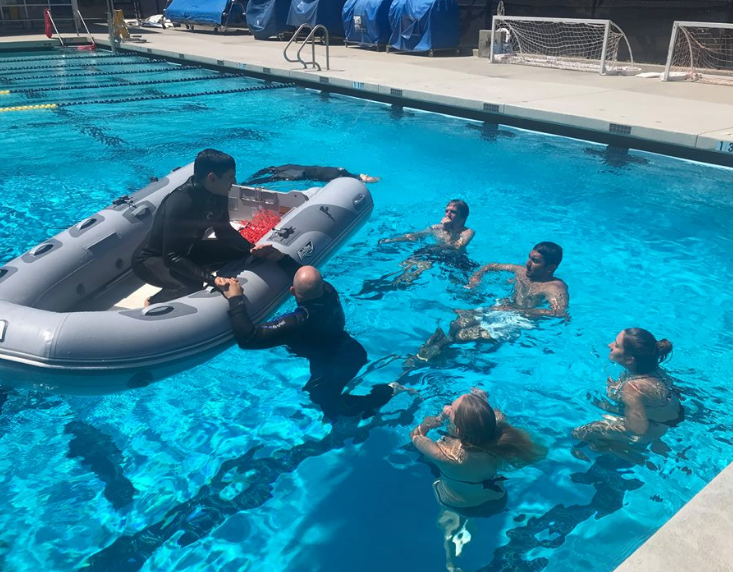 REU students learn the basics of boating operation and safety as part of their scientific boating workshop. “Beyond working with scientists at CSUMB, students may also elect to work with faculty at our partner institutions to include: The Elkhorn Slough National Estuarine Research Reserve, Hopkins Marine Station of Stanford University, Monterey Bay Aquarium Research Institute, Moss Landing Marine Labs and the Naval Postgraduate School,” said Garza. In addition to the 10-weeks of integrated research experience with professionals in the field, the REU program helps students develop a roadmap for their own careers while providing an opportunity for students who have historically been underrepresented in ocean science academic and professional settings. One of the 2017 CSUMB REU program graduates, Daniel DeLeon, was recently featured in a Google documentary exploring his journey as a Latino engineer and the technology he is using to track endangered whales in the Monterey Bay. Born and raised in Santa Cruz, California, Daniel started his education at Cabrillo College in Aptos, conducted research at Monterey Bay Aquarium Research Institute, and is now a student at California Polytechnic State University. Garza, who serves on the national board of directors for the Society for Advancement of Chicanos/Hispanics & Native Americans in Science (SACNAS), advocates for increasing underrepresented students in STEM and believes that engaging new and diverse talents and perspectives will help advance scientific discovery.